Is that question mark hanging above my head so obvious? :-D In all seriousness and honesty, I sometimes worry about our new journey. And I believe that nothing can really prepare you for life with baby and that's really the beauty of it if you come to think of it, I know. That said I do enjoy reading, talking with friends and family, looking at vlogs and basically doing anything I can to prepare for the next phase. Hope these books are useful to you, let me know what you think and feel free to share your great tips for books, blogs, blogs, etc. on pregnancy and maternity in the comments below. Let's help each other where we can! My book selection has one thing in common that makes reading so pleasurable: every book is written with a sense of humor and that's great because this makes this ton on essential information light and easy to read. I'm thinking of you too, my sweet pregnancy brain tribe <3. could you make me a cup of tea please? My back aches so bad! Disclaimer: Excuse me please for any crazy outings and special grammatical/spelling inventions in this post and future posts, I'm convinced that baby boy Goudmanneke steals a piece of my brain every day, haha! - This post was in no way sponsored. Seriously this is my PREGNANCY BIBLE! :-) If you only need one book, it's this one! This book covers the nine month journey of pregnancy in detail, the most important health questions that keep you awake at night, tips on what to eat and what to avoid and so information you don't want to miss out on. Finally a book for daddy-to-be that he will actually love! So thank you Gerard Janssen, a daddy himself, who wrote this a-m-a-z-i-n-g book. This book provides modern day men with the necessary information about how they can assist their loved one during pregnancy and delivery. Each chapter is filled with humor and great illustrations as well, that's another plus! A must-have for him and the perfect present don't you think? I bought this book for Abbas and he absolutely loved reading it front to back as he loves being involved in the whole process. And that's just one of the many reasons why I love him so deeply. Weep weep. This is another great book by Mama Baas. I guess you can tell by now, that I'm a big fan of Mama Baas. 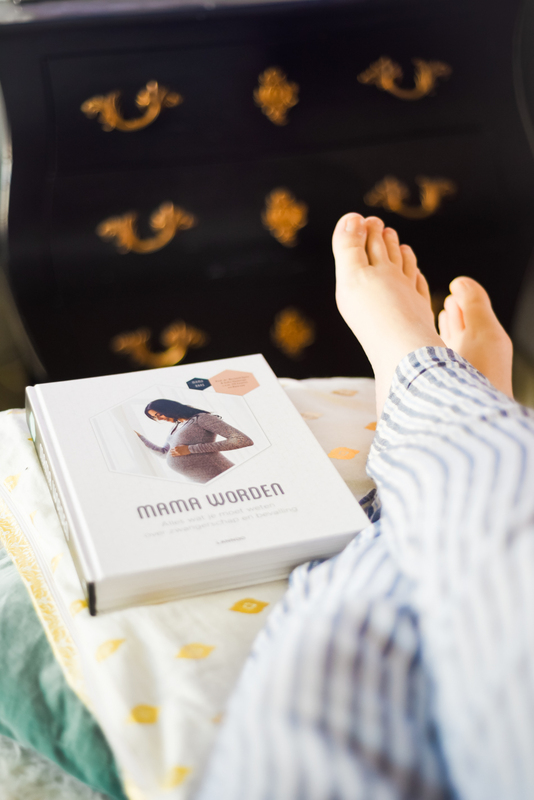 :-) And this book is a great practical guide for mommy to be, including reminders of to-do's before baby comes and what to expect in those first days. This is actually a great resource for your partner as well. Still on my bed stand, reading the final chapters, I must say it covers a lot of questions (and I told you about my big question mark already) that I and supposingly many moms-to-be have. Similar to Ik Word Mama - SOS-reminderlijstjes, tips & steun in bruisende babydagen , this book talks more in to depth about the transition of becoming a mother, also what to expect when baby arrives and how to adapt to your new situation with emotional and psychological support. Last but certainly not least in my current book selection is the EHBK book written by Dr. Sofie Vanderoost. (Mama Baas <3) A keep-by-your-side practical resource for those moments when mommy and daddy's help is needed ASAP for instance when the little one is sick, in case of nightmares, stutters, etc., basically for situations that aren't emergencies that you can't resolve without going to a doctors office.